These pesto potatoes are a fantastic side dish. 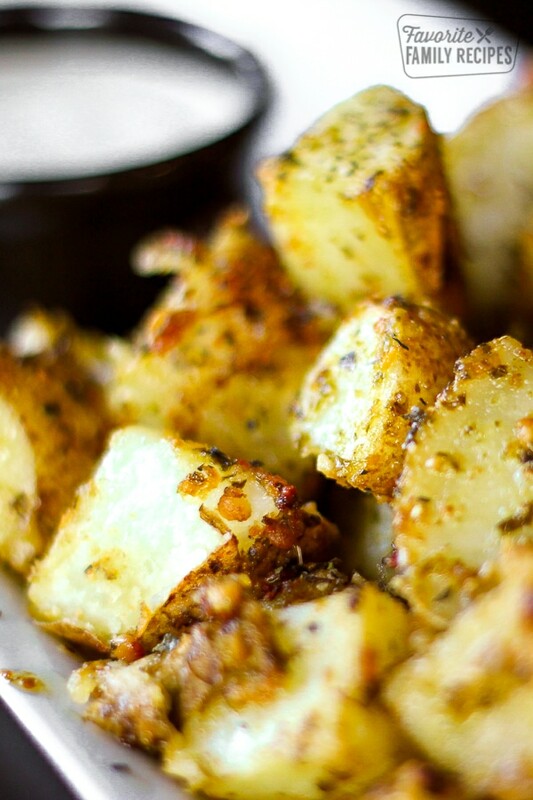 Diced potatoes coated in pesto and roasted or grilled to perfection. So easy and packed with flavor! In my opinion, pesto is good on just about anything, but it is especially delicious on potatoes. If you haven’t used pesto in cooking before, you’ve got to try it! Pesto originated in Genoa, Italy. It is made with basil, olive oil, pine nuts, and Parmesan cheese. It is delicious on pasta, sandwiches, chicken, and vegetables. You can make your own pesto or purchase it pre-made. We have a delicious recipe for homemade pesto here. It is my favorite! It can also be purchased at Costco in their refrigerated section. There are also dry mixes you can buy at the grocery store. Homemade is definitely the best! We like to make Pesto Potatoes to accompany when we are grilling up steaks or chicken. They are great on their own but we like to dip ours in sour cream or ranch. Whether you are looking to switch up your boring side-dish rut or trying to impress guests with your amazing culinary skills– these potatoes are for you! Sometimes in the summer, instead of cooking with the oven and heating up the house, we will just wrap these in foil and cook them over the grill. Just cook them over medium heat. They are ready to eat when you peel back some of the foil and potatoes are fork tender and break apart easily. This is a great option when you are already grilling and a perfect side dish to a lot of our grilled chicken and steak recipes. A few of our favorites are our New York Steaks, our Honey Mustard Nectarine Pork Kabobs, and Grilled Malibu Chicken. So yummy! These pesto potatoes make a fantastic side dish. They taste delicious and they are easy to make. It just takes a few simple ingredients and an oven! Scrub (but don't peel) potatoes and cut into large cubes then place all the pieces in a large plastic bag. Add about 3/4 cup pesto sauce to the bag and shake it around until the pesto is coating all the potato pieces. Pour the contents of the bag out onto a cookie sheet. Arrange the potatoes so they are laying flat then sprinkle with parmesan cheese. Bake at 450 degrees for 25 to 30 minutes, or until they begin to look lightly toasted. What a brilliantly simple recipe, I think I would try it with Red Pesto too! Are all these yummy recipes in your new cookbook? I’m spending a lot of time downloading recipes; maybe I should buy the book! There are over a hundred of our favorites from the site. And over 50 new recipes just for the cookbook! When do we add the Parmesan Cheese? You sprinkle it on before you bake it. It would be great if you would encourage people to mix it all up in a bowl instead of using single use plastic to coat the potatoes ♻️???? i am tripling the recipe for easter gathering…..can I boil the potatoes a day prior? We have never tried it that way so we can’t say for sure. If you try it out, let us know how it turns out!